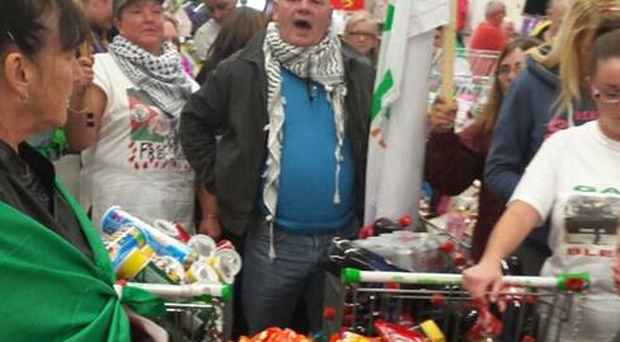 A group of pro-Palestine demonstrators have removed what they said were Israeli-linked products from the shelves of a supermarket in west Belfast. Dozens packed into the supermarket at the Westwood Centre on Kennedy Way at around 6.30pm on Monday - many chanting 'Free Palestine' - before taking numerous products off the shelves which have 'ties' to Israel. They then filled shopping trolleys with the goods. In a statement on Facebook, the group said "We call on others to join the boycott, stand with us over the coming weeks as we take the campaign to those who ignore the plight of the Palestinian people." Last week dozens of people removed products, including those made by the Coca Cola company, from the shelves of Sainsbury’s supermarket in west Belfast. Many held aloft banners and flags, shouting 'Free Palestine'. The footage was published by Seosamh O Bradaigh. The clip has already received a huge amount of attention through social media. Elsewhere, last week leading supermarket chain SuperValu has confirmed it ordered all stores to remove Israeli carrots from their shelves in the Republic. Despite insisting it has not enforced a boycott of goods from the country, an email instruction was sent to all 232 stores last Friday saying the Chantenay variety must not be sold. SuperValu denied it was imposing a formal ban against Israeli goods in its shops. In a statement, it said: "SuperValu is not involved in a boycott of Israeli produce and ultimately consumers will make their own purchasing decisions. "We understand that this is an emotive issue. However, we have a policy of not taking a position on international affairs."